Regardless of what your opinion is on The Blair Witch Project, its sequel Book of Shadows: Blair Witch 2 is a travesty. I personally like to think that this is the movie for those who complained about the original film not being scary deserved, or claimed that it was simply an annoying tale of three annoying people lost in the woods who argued a lot. But, alas, no one deserved this. As everyone knows by now, The Blair Witch Project opened in 1999 to incredible business, it was heralded as the "next big thing" in cinema horror. Because of the hype though, the backlash was equally heated and intense. Many loved it (including me), but many despised it for not living up to the hype. The real coup, however, was the fact that the internet coverage and documentary type footage had many people believing that the events in the film actually happened. This is the promising jumping off point for Book of Shadows: Blair Witch 2. At the beginning of the film, we are treated to some nifty documentary style footage of the town of Burkittsville and how it is handling its sudden fame. Tourists besiege the town, touring the woods, and buying into the fact that the Blair Witch is indeed real and that those 3 filmmakers actually did disappear in the woods. After this very interesting start, the film falls completely apart. Next we are introduced to the five main characters; Jeff is a tour guide who is leading the four others on a journey into the Burkittsville woods, Erica is a Wiccan who wants to meet the Blair Witch, Kim is a moody Goth chick who thought the movie was cool but doesn't really believe it, Stephen and Tristen are a young couple who are researching the hype surrounding the first film. Yes these characters are written to be aware that The Blair Witch Project was a movie, and not actually fact. Anyway, the five find a nice area to camp in the woods, near the spot where the film footage for the first movie was reportedly found, and set up cameras just in case the Blair Witch shows up. They drink, talk, flirt, talk, drink, drink, and talk some more, then finally pass out. The next morning, all of Stephen and Tristen's research documents are shredded. Jeff takes the group back to his hideaway, a big abandoned warehouse in the middle of nowhere. While they sit and wait, they review the videotape they recorded that night and noticed a time shift of a couple of hours that is not recorded. Where did the lost time go? Thus is the mystery surrounding Blair Witch 2. Yes I kid you not, the whole movie is basically about trying to watch a videotape. Director Joe Berlinger, who also cowrote the screenplay, obviously has no idea how to generate any suspense or scares. The whole movie relies on hallucinations; i.e. someone sees something spooky, they look away, then look back, then the spooky thing is gone. The spooks include ghostly children, dogs, and, yes, the old standby, an owl. Anyway, everyone begins to hallucinate, Tristen starts to act weirder and weirder, Erica disappears, and everyone basically spends the whole movie looking at the videotape and arguing...constantly. Critics of the original Blair Witch Project complained that it was just three people arguing a lot. Yes and no. Those characters began to argue late in the movie as their situation became more and more dire, it was tension that ratcheted up the already increasing sense of dread. Here the arguing is repetitious and pointless, "What is going on? ", "What are you doing?" and the like screamed ad nauseaum to each other. The acting, to say the least, is pathetic; all posing and completely lacking any charisma. The special effects are leaden, the pacing has all the flow of cold molasses, the screenplay and dialogue are strictly amateur night. There are zero scares, no tension or suspense, and it just coasts along until the grand finale which is just too lame to even get into. And just as it all is wrapping itself up, it abruptly ends. I have no idea who the audience for Book of Shadows: Blair Witch 2 would be. Fans of the original will leave feeling severely betrayed and pissed off, non-fans will simply laugh it off the screen. Rarely has a sequel or remake been so ill-conceived since Jan De Bont's The Haunting. Two footnotes also. Aside from the mentioning of the search for the Blair Witch in the film's opening scenes, there is little that really has anything to do with the Blair Witch. All of the events really could have been cut and pasted into any other film with little alteration. 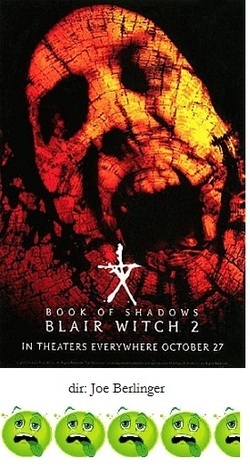 Secondly, even though the title is called Book of Shadows: Blair Witch 2 there isn't a book anywhere in the film, and the shadows are few and far between.